…began in the noughties, when I started teaching children from five years of age. While I might look back and cringe a little at how I did things then, I must have been showing some potential because the class grew in popularity. Prior to that, my background was many years in corporate training in subject matter varying from MS Office applications to facilitating cultural and organisational change programs, writing user manuals for enterprise-scale business software and various other operations manuals, and even at one point being involved in negotiations in a workplace agreement for a manufacturing company. This developed a strong set of skills that only just set me at the threshold of my great adventure as a martial arts instructor. The trickiest group of people to teach well is young children. (Truth be told, the trickiest group of people to do anything well with is young children…) But they are probably the funnest, and my inner child gets regular and frequent workouts, much to my own delight. It’s crucial to stay in touch with that sense of fun and wonder that us grown-ups tend to lose because we think we’ve seen it all before. The beauty of martial arts though is that most of what we learn has never been experienced, so it’s pretty easy to again get that feeling of novelty. And, despite teaching martial arts full-time for well over a decade now, even still I discover something new in almost every class I teach, whether it be a new way to pass on knowledge, or the revelation of yet another way in which our martial art is so amazing. Being human, there are days of course where my sense of humour gets left at home, caught behind the front door as I leave, or it’s still snoozing under my pillow, but it doesn’t take long to figure out that the class will be a disaster if sensei does not also join in the fun. I am very fortunate too, that as soon as I step on the mats, the passion and fascination I still feel for my martial art is there. Some days: thank goodness 🙂 . The longer I teach, the more I understand that the more fun I’m having, the more fun the students will have and the more they will both learn and want to keep coming back. Given the incredible importance (and benefits) of learning a martial art, that’s a really big deal. So, my aim always (and obviously) is to have as much fun as possible. Well, why not? As you can imagine too, we get our fair share (or more) of challenging personalities coming into our classes. My philosophy is that it’s my job to make sure these students have a good time too. It might take a little while to figure out how to make that happen, and definitely it takes some personal soul-searching for what makes a particular person difficult for me to relate to, but it is almost always worth the effort, if I can just get out of my own way. But being a good martial art instructor is more than just being able to stand in front of a group of people and teach them the most effective technique for subduing an angry or dangerous opponent. There must be something from which to teach, together with a plan for where it is all heading. In my experience with this beast, the trickiest kind of user manual (our syllabus) and training guide is by far and away that for a martial art. Essentially, human movement has to be sensibly described, and then translated not only into ‘kid-speak’, but in such a way as to make it understandable to a five year-old, and not condescending to a ten year-old. Try that one on if you dare. 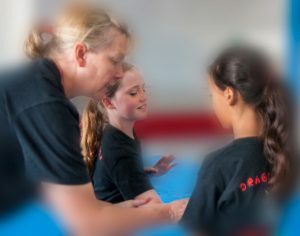 Instructors of martial arts are also faced with the choice as to whether to prepare students to optimise their chances in a competition where strict rules apply, or for a situation where to lose potentially risks life or limb. Our martial art is a beautiful thing–to watch a master such as Sensei Geoff Smith in motion is a joy–but I feel making a competition of it seems to miss the point of it. For me it’s a no-brainer: a martial art’s purpose is to enable one to protect oneself from physical harm by an attacker. I understand why one would want to show off a beautifully executed kata, but I worry that this training is at the expense of spontaneity. Repetition is crucial to make certain motor skills instinctive, but it needs more; from personal experience, a technique trained to air pretty much always comes unstuck the moment a partner becomes involved in the process. I had to get a whole bunch of experience in a whole bunch of different things to be able to do what I do as well as I do it. Being a martial arts instructor has made me a better martial artist and, I believe definitely a better human.